Leading CI distributor, AWE, returns to ISE 2019 with a whole host of solutions for home integration. 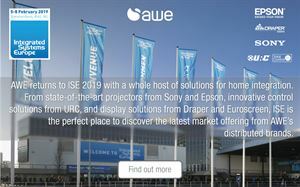 From state-of-the-art projectors from Sony and Epson, innovative control solutions from URC, and display solutions from Draper and Euroscreen, ISE is the perfect place to discover the latest market offering from AWE’s distributed brands. As the base for AWE, the URC booth is where you can be sure to find members of the team. Featuring a full graphical update, a new user interface and advanced logic, Total Control 2.0 enables integrators to put homeowners in charge of their home with a seamless, intuitive and versatile solution. URC will be showcasing the new flagship MRX-30 Advanced Network System Controller (quad-core processor) and the new MRX-15 Advanced System Controller (dual-core processor) to deliver powerful automation and control for residential installations. These powerful controllers provide instant two-way communication with the family of Total Control user interfaces and are compatible with third-party devices. Both processors offer IP, IR, RS-232, 12V trigger, relay, and sensor communication for robust integration and superior performance. The new URC TDC-9100 tabletop touchscreen controller and TKP-9600 in-wall touchscreen focus on performance, design, and efficiency, which sees them appeal to integrators and their clients, including homeowners, architects, and designers. These panels provide next generation, primary whole-house control of entertainment and smart home products. Featuring a 10" colour screen, built-in camera, microphone, and AV intercom, these products are ideal for door integration, room to room, and whole house communication. Visitors to ISE will have the opportunity to experience the benefits of the system, and the range of solutions available. AWE has recently announced its appointment as an authorised distributor of Sony Home Cinema Projectors and professional Blu-ray Disc™ Players, presenting its customers with a high-quality option for dedicated home cinema and living room environments. Visitors at ISE 2019 will be able to book appointments with AWE to see the latest developments in home cinema projector technology. The market-leading Sony Home Cinema Projector range features a wide range of models — VPL-VW270ES, VW570ES, and VPL-VW870ES — which are designed to bring 4K detail to any home entertainment system. They produce true 4K resolution with Sony’s latest 4K SXRD panels for stunning cinema viewing and incredibly lifelike colour. High brightness guarantees exceptional picture even in well-lit rooms, whilst Sony’s TRILUMINOS colour reproduces more tones and textures, and excels in fast-moving scenes. With SRP’s from £5k to £65k, the projector range achieves cinematic clarity, smooth motion, and sharply detailed image for true cinema format lovers. Epson projectors provide an entry level full HD offering from just £600, with the company’s premium 4k enhanced EH-TW7400 and EH-TW9400 products are receiving great acclaim, starting at £2,200. These projectors, with great connectivity and flexible installation options, ensure consumers can enjoy the big screen experience from 4K content at an affordable price point. Anyone who wants to discover more about the best home cinema projectors below £3K on the market, featuring Epson’s superior 4K enhanced 3LCD technology to create vivid, lifelike colours and deep blacks for defined detail in the shadows, ensuring consumers can enjoy the big screen experience and the best looking 4K content. Contact sales at AWE at any time. AWE supplies both fixed and tab tensioned electric Draper screens that feature an ambient light-rejecting fabric that is perfect for home cinema installations, on display on stand 12-K60. Draper has one of the most comprehensive product ranges in the industry. To ensure optimum picture quality in differing viewing environments, Draper screens include a number of specifically engineered fabrics, including Matt White, acoustically transparent NanoPerf and ambient light-rejecting versions. Also available via AWE, the Euroscreen projector screens are ideally suited for home cinema projects, with a variety of fixed, manual and electric options. The Euroscreen products complement the complete home cinema offering from AWE, with both electric and manual products from the popular Diplomat collection, as well as permanently tensioned Frame Vision Light screens. Screen sizes range from 86” to 131” to provide integrators complete flexibility. HDANYWHERE plans to add six new MHUB 2.0 video matrix models, standalone uControl zone processors and an improved audio matrix-amplifier to its multiroom AV system line-up at ISE. Designed for the most-modern home entertainment market requirements, the new matrix models ‘MHUB U 2.0’ and ‘MHUB PRO 2.0’ are fully HDMI 2.0 compatible, boasting 18G HDMI interfaces that support the latest 4K HDR video content and Dolby Atmos surround sound. The new MHUB PRO 2.0 systems feature a whole range of performance improvements and functionality upgrades, which specifically address the needs of a contemporary install. For more information on the products available from AWE or to book an appointment at the show call +44(0)1372 729 995 or email [email protected].